Well - one of the most popular wayswater extraction, the use of which allows owners of suburban areas have the dual benefit of getting high-quality water and savings in financial costs. 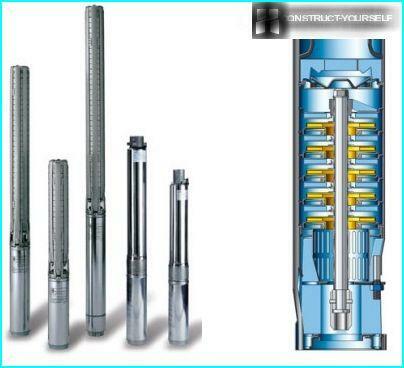 Drill wells, it is possible to ensure the supply of water at any time of the year. But a narrow opening in the ground can not serve a good source of water, only improvement of the well to the water allows you to reviver suitable for use and consumption. Drilled water wells, you can startits arrangement. To ensure uninterrupted supply of water is necessary to install special equipment, which include: the caisson, pump, accumulator and headroom for a well. Before proceeding to the arrangementWell, it should be properly selected structural elements in order to protect yourself in the future from unnecessary hassle and expensive equipment repair costs. Caisson - one of the basic designelements for everything. 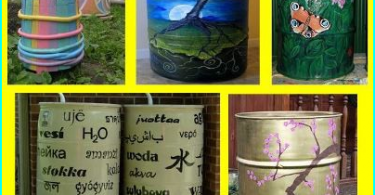 Externally similar to the barrel waterproof container designed to protect the water in the water intake system from freezing and mixing with groundwater. The sealed design can be placed automatic equipment, filters, diaphragm tank, pressure switches, pressure gauges and other components, thus freeing from excessive accommodation units and appliances. Caisson usually equipped with a neck with a tight lid. Fact! 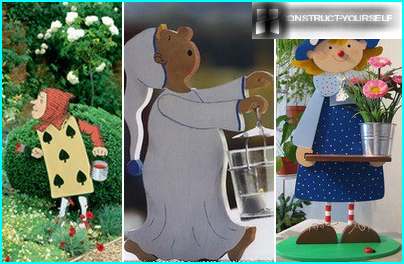 For the arrangement of the well in the home are most commonly used cylindrical products with a diameter of 1 m and height - 2 m.
For your well regularly served in the next few decades, you must correctly select the submersible pump. 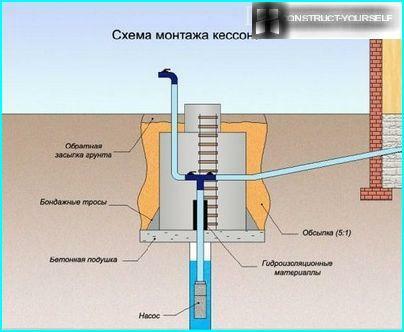 In the calculation, the result of which shall beparameters of the product, take into account the diameter and depth of the well, the length of water pipes, peak water flow from all connection points. For stable operation of the water supply system is necessary to maintain the operating pressure in the range from 1.5 to 3 atm., Which is equal to 30 m water column. The main function of the accumulator - maintenancesmooth and fluid pressure change in the water intake system. In addition tank ensures a minimum supply of water and protection from water hammer. 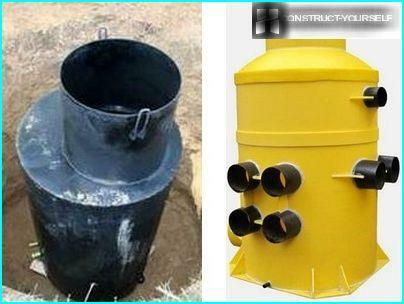 They differ only device accommodates volume of water, and from 10 to 1000 liters. Installation tip allows you to protecthole from debris contamination and runoff of meltwater. Design, sealing the hole, is also intended to simplify the technical operation of the well, and particularly the suspension pump. household owners are not in a positionenough time, knowledge and skills to understand the communication schemes can always entrust this important job skill. Especially masterovitye do everything themselves. But even if you someone will carry out all the work, you will need to check it out. Thus, the organization of independent water supply takes place in several stages. 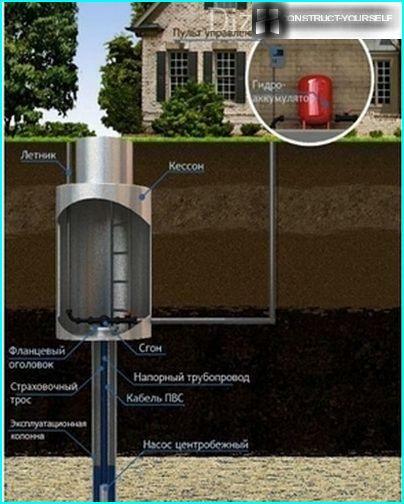 To install the caisson must be prepared pit,you should dig around the well to a depth of 1.8-2 meters. The dimensions of the pit by dimensions container, its average width is 1.5 m. As a result, the pit must be formed in the middle of which sticks out the casing. If the pit is filled with groundwater, it is necessary to create an additional recess in order to timely exercise their evacuation. In the bottom of the caisson to be cutan opening equal to the diameter of the insulating casing. Prepared caisson can be lowered into the pit by placing in the center of the well bore. After that, the casing can be cut and welded to the bottom of the caisson by electric welding. By the assembled structure is necessary to connect a pipe to bring water and electric pump cable. The caisson is filled with a layer of soil: on the surface of the lid should remain only serving the entrance to the building. rope, with which the pump is attached to the tip cap should be made of stainless steel or have a watertight sheath. 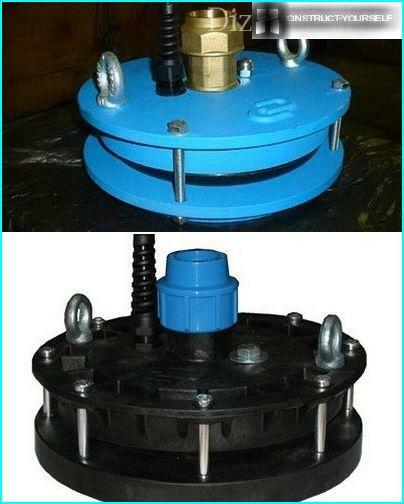 Making the installation of the pump can be installed well head, which seals and protects the wellhead. 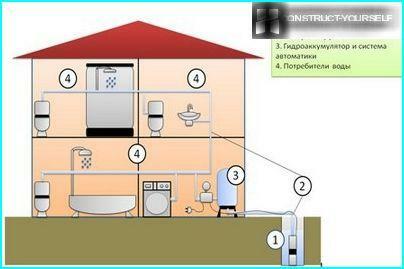 To ensure an uninterrupted supply of water is not possible without installing the accumulator. The operating principle of the system is quite simple - afterStart the pump empty the tank is filled with water. By opening the tap in the house, the water flows into it from the accumulator, rather than directly from the well. As the water consumption of the pump again automatically turns on and pumps water into the tank. Installation capacity in the engineering system must beproduce, leaving easy access for repair or replacement in the future. 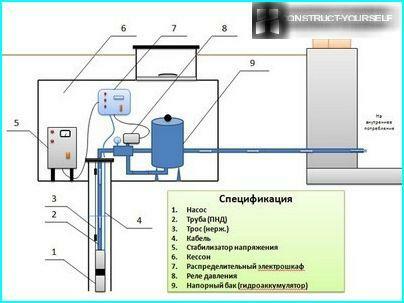 In the installation place of the tank, the water in the course of movement, the check valve must be provided. Before and after the placement of the tank, you must install a drain valve to drain the water. Securing the accumulator using the rubber seal will reduce the level of vibration.